15x4'h in. high. Plays in 7 keys. 12-chord Autoharp only. Plays 5 keys. Case for either Autoharp above. Vinyl on chipboard. Autoharp record course. Easy way to learn. Good tone, easy response ..
finest instrument makers in Elkhart, Ind. body and keys. Integral tone holes; rib mounted mechanism. on plywood case. Instruction book included. seasoned to prevent cracking. Center-ground tone holes. tips. Nickel mouthpiece, receiver, bracing. Tuned to A-440. position markers for easy chord changing. Shoulder strap, pick, songbook included. Allow 10 lbs. per postal regulations. strings. Wide rosewood fingerboard . around soundhole, center of headplate. record, pick incl. 15x33Ax40 in. board with 4 white position markers. record incl. 131Ax4 '1lx36'h inches long. ment. 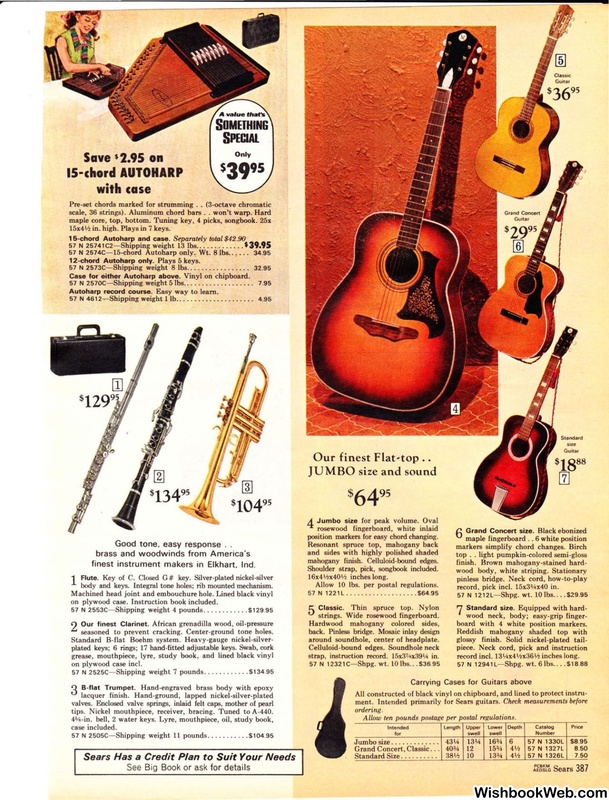 Intended primarily for Sears guitars. Allow ten pounds postage per postal regulations.